Two of Southern California's most active faults could rupture together in a magnitude-7.5 earthquake, according to a new study, raising a grim seismic scenario for communities east of Los Angeles. 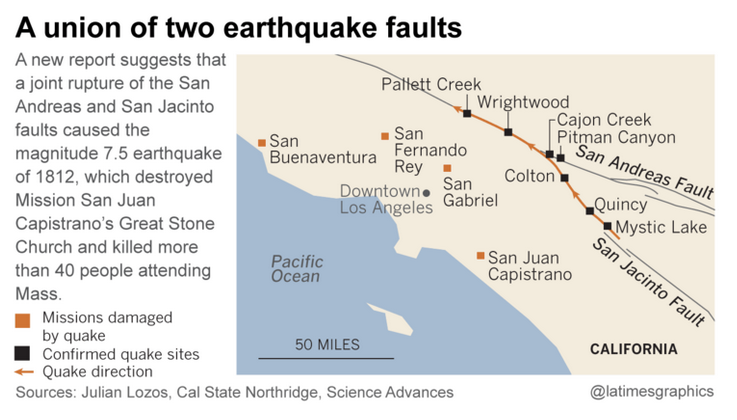 The study established how a major earthquake could begin on the San Jacinto fault and continue on the San Andreas, which is California's longest and one of its most dangerous faults. The San Andreas historically has produced stronger earthquakes than the San Jacinto. But it's farther away from major development than the San Jacinto fault, which runs through San Bernardino, Colton, Moreno Valley, Redlands, Loma Linda, Hemet and San Jacinto, as well as near Riverside, Rialto and Fontana. "Because the San Jacinto fault cuts into the middle of the Inland Empire — instead of the edge of the desert — it cuts through a lot more people. There's just more people directly living on this fault," said Julian Lozos, a Cal State Northridge professor of geophysics, who wrote the study while working on post-doctoral research at Stanford University and at the U.S. Geological Survey. The faults also cut through freeways that connect Southern California to Nevada and Arizona, as well as lifelines that bring in electricity, fuel and water. The earthquake envisioned in Lozos' scenario is not the biggest earthquake that could strike Southern California. The San Andreas alone could produce a magnitude-8 earthquake. But the study shows it's not just the San Andreas that should worry Southern California. There are, in fact, multiple pathways to get to a Big One, the kind of earthquake that could cause more than 1,000 deaths, ignite hundreds of fires, collapse buildings and leave lasting scars that take a generation from which to recover. "There's a growing recognition that the fault network is more complex — and you can have the participation of multiple faults in a single rupture," said U.S. Geological Survey research geologist Katherine Scharer, an expert on the San Andreas fault who wasn't affiliated with the study. "I think this study reflects the general agreement that the San Jacinto plays an almost-equal role to the San Andreas in terms of direct hazards to Southern California," Scharer said. "The San Jacinto goes right through downtown San Bernardino. "For the larger Los Angeles region, a rupture on this fault could produce equivalent amounts of damage as the San Andreas," she said. The reality could not be worse for San Bernardino — a city of 215,000 people that fell into bankruptcy in 2012 and suffers from one of the highest poverty rates among the nation's largest urban areas. San Bernardino has one of the largest concentrations of earthquake-vulnerable brick buildings in a location with a high risk of intense shaking. San Bernardino has no law requiring owners to retrofit brick buildings, which have collapsed catastrophically in previous earthquakes and are a known killer. As of two years ago, there were more than 100 brick structures that haven't been retrofitted in the city. Despite its lower profile, the San Jacinto fault has been a known risk for some time. It stretches for 130 miles, from the Cajon Pass in San Bernardino County southeast toward the Mexican border. The 1987 Superstition Hills earthquakes, which hit about 90 miles east of San Diego, topped out at magnitudes 6.5 and 6.7, and caused $3 million in damage in Imperial County. The idea behind the study, funded by the National Science Foundation and published last week in the journal Science Advances, resulted from the scientific mystery of the great 1812 earthquake. The quake was so extensive that the missions of San Gabriel, San Fernando Rey and San Buenaventura in Ventura reported damage. The quake sent the masonry of the Great Stone Church at Mission San Juan Capistrano tumbling, killing more than 40 people attending Mass; its ruins still remain to this day. A classic explanation has been that it was the San Andreas fault alone that caused that earthquake. But concrete evidence indicated only that the fault ruptured in 1812 on a 40-mile segment of the fault, between the Cajon Pass and Palmdale, Lozos said. The problem? That segment was too short to make an earthquake of that size. Lozos began exploring a relatively new idea based on newly published paleoseismology reports generated by scientists investigating evidence of ancient earthquakes along the San Jacinto fault. These other scientists discovered evidence of a mystery earthquake in the early 1800s. Lozos then posed a hypothesis: What if the 1812 earthquake was caused by the San Jacinto and San Andreas faults? To test the idea, Lozos created a computer model. He gathered information on the shape of the faults, how seismic waves work with the local geology, and the suspected seismic stress on the faults. The computer model showed that both the San Jacinto and San Andreas needed to rupture to produce the movement observed by the paleoseismologists, Lozos said. Scharer said further study should occur to determine if the study's conclusions stand up to more scrutiny. But she said the approach was interesting: "It's using state-of-the-art computer models to ask if what has been observed in geology is possible, given the physics of the earth." "It reminds people — just because they don't live on the San Andreas, that doesn't mean they aren't near an active earthquake fault," Scharer said. There have been several examples of earthquakes jumping faults. I'm trruly enjoying thhe design and layout of your blog.